We all want a happy, enjoyable relationship with our dog, but sometimes things can go off track. With time and patience most dog behaviour problems are easy to resolve, so don't give up. Click below to find out how I can help. Looking to improve your pet services business? 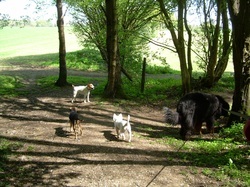 I started my first dogwalking business in 2001 when this type of business was relatively unheard of in the UK. Since then I have built my business from scratch and no experience to a group of 5 businesses, all offering a wide range of pet care services, including dogwalking, petsitting visits, home boarding for dogs, housesitting and dog behaviour training. I pride myself on making my businesses the best they can be - I have made many mistakes (some of them very costly) along the way - so I now want to share my expertise with you to hopefully save you wasting time and energy on things that are never going to work, concentrating instead on proven success strategies.